While no one I know personally has ever been infected with rabies, I do recall a tale of my father donning a racing helmet and wielding a tennis racket to rid our house of a bat. Presumably, he was protecting us from rabid bat fangs. 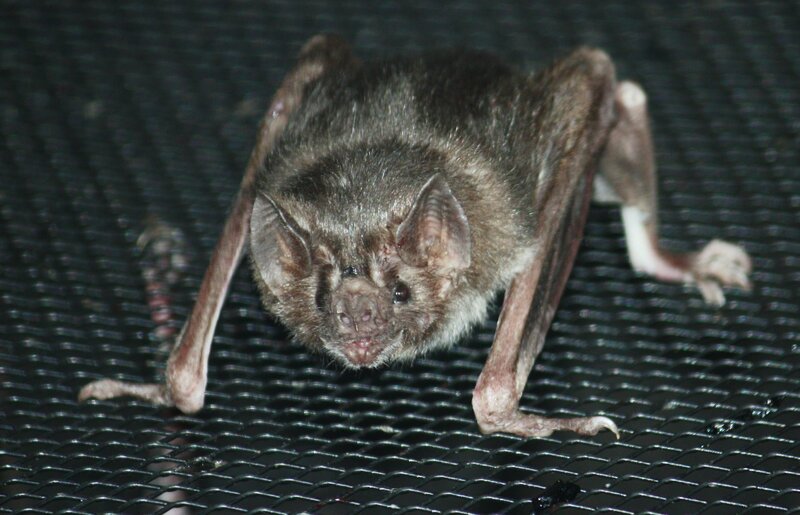 Rabies is relatively well controlled in the US through pet vaccinations and early prophylactic care when someone is bitten by a potentially rabid animal. While rabies as a health concern in the US may be fading, rabies as a molecular biology tool is a cutting edge new technology. New molecular tools are taking advantage of the skills of the rabies virus. In a rabies virus infection due to an animal bite, the virus makes its way from the bite to the nearest neuron. From there, it has perfected a series of steps in which it amplifies the numbers of rabies virus in the cell, travels along connected neurons, follows those connections all the way to the brain. Traveling from the terminals of a neuron toward its cell body is called retrograde infection or transport. 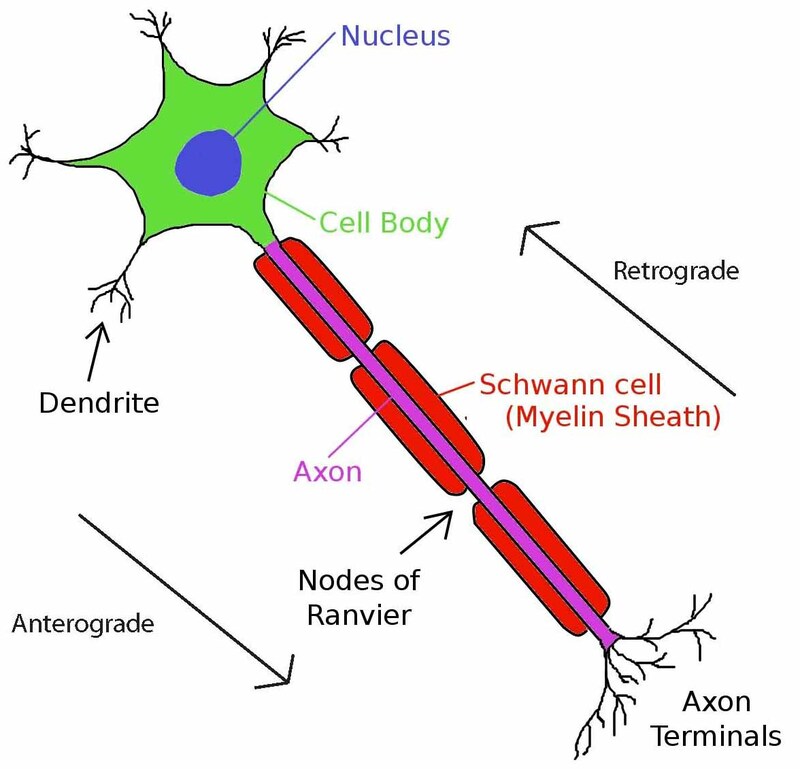 This is a cartoon rendering depicting the general structure of a neuron. Signaling is normally initiated in the cell body and is propagated anterogradely toward the axon terminals where the signal will be passed on to another cell. Sometimes signaling molecules can travel back toward the cell body and this movement is called retrograde transport. Dendrites are the structures that receive signals from other cells. The ability of the rabies virus to infect neurons and travel across connections is co-opted by new tools that engineer the rabies virus to also carry genes or fluorescent molecules into those infected cells. This is a new method for transferring DNA from a virus into a cell, also known as transduction. This transfer can be used to study the activity of a foreign gene in a particular cell. It can also be used to express of a fluorescent marker that helps scientists examine the shape or structure of the cell. Rabies virus is much better at transducing neurons than the most common method currently used, adeno-associated virus (AAV) transduction. A neuron transduced by AAV infection will only begin to express packaged genes or fluorescent molecules after several months of infection. This limits the types of experiments that can be done with these labeled neurons. A rabies virus can express enough of several molecules quickly enough to allow the observation of very fine structures, like dendrites. The natural mechanism of rabies is retrograde travel from the terminals of neurons back to their cell bodies. This is valuable for some studies, but scientists have been working to decouple the strong expression of genes and fluorescent molecules from the retrograde travel. To do this, scientists replaced the normal viral coating of the rabies virus with the coating from a virus that does not infect neurons the same way (vesicular stomatitis virus (VSVG)). This change allows the virus to infect only those cells near to where the virus is injected. This makes this tool much more powerful for studying neural connections because the rabies virus doesn’t continue to spread through all the connected cells. As a scientist, if you’re looking for a particular tool, it’s often the case that nature has already built something useful, like rabies. With a little tweaking, you can make a tool 10X better than anything a company could make from scratch. This entry was posted in Curiosities of Nature and tagged axon, molecular tools, neuron, rabies, synapse, transduction. Bookmark the permalink.